Your donation makes this resource possible. The suggested donation for use of this lesson is $3.00...Click here. 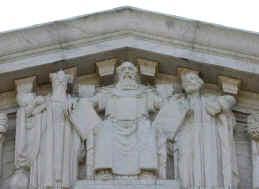 As you walk up the steps to the building that houses the U.S. Supreme Court you can see near the top of the building a row of the world's law givers and each one is facing one person in the middle in full frontal view--it is Moses and he is holding the Ten Commandments! As you enter the Supreme Court, on the lower portion of the two, huge oak doors, the Ten Commandments are engraved on each. As you sit inside the courtroom, you can see the wall, directly above where the Supreme Court Judges sit, a display of the Ten Commandments. James Madison, the fourth president, known as The Father of Our Constitution made the following statement, "We have staked the whole of all our political institutions upon the capacity of mankind for self-government, upon the capacity of each and all of us to govern ourselves, to control ourselves, to sustain ourselves according to The Ten Commandments of God." Thomas Jefferson worried that the Courts would overstep their authority and instead of interpreting the law, they would begin making our laws an oligarchy--the rule of the few, over the many. Get the USA Patriotic Catcher. "Why did the Pilgrims come to America? And what does the First Amendment guarantee?"